Dimensions: 10 x 9-5/8 in. 36 pages. For ages 4-9. 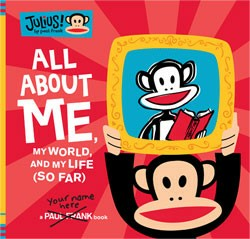 Julius and his friends are on hand to help kids create a unique keepsake book that's all about themselves. Early to middle elementary-aged children will delight in drawing and writing about home, family, school, friends, and all their favorite things. Then, in a few years, they can look back and see what they were like, how much they've grown and changed, and how wonderfully unique they still are!